After having bright pinks and corals for my last few sets of nails, I felt like going for something a little more understated this time. I had a few different colours in mind and couldn't decide which, so I just stuck my hand in the bag and went for the first one I pulled out- Essie Go Ginza. (Yes, I have a bag of nail varnishes. I need some sort of actual storage system but, for now, a big Boots carrier bag under my dressing table will do). Go Ginza is the palest lilac shade which is almost white under some lights. I love this because it seems to be a different colour every few minutes- from lilac, to grey, to white- and each one is really pretty. This also makes it really versatile so I don't need to worry about my nails clashing with my outfit. To be honest, this is not something I ever worry about, but it's still nice when they work well together. As with most Essie nail varnishes, Go Ginza is opaque from the first coat, so there are no patchy or streaky bits, and it has a lovely glossy finish. I'm so glad I pulled Go Ginza out of the bag. The pale, delicate shade is beautiful and I can't stop staring at my nails! 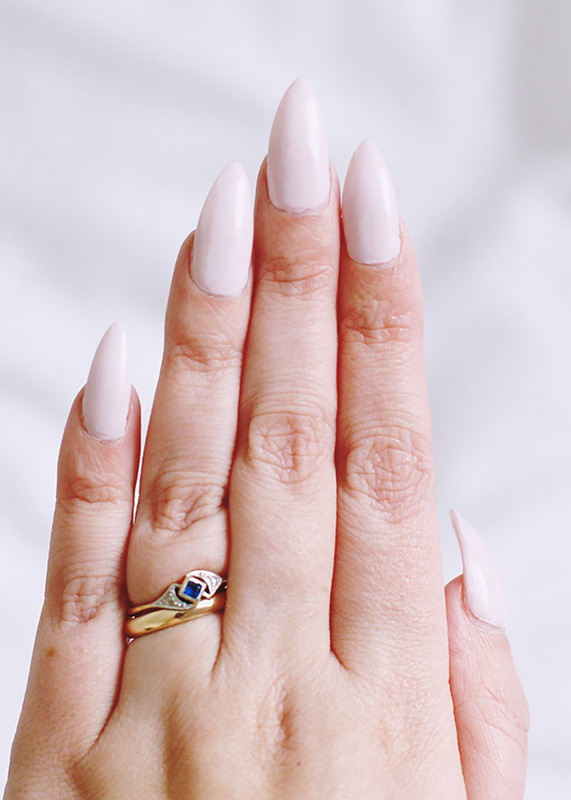 I love a good subtle nail varnish and this one is perfect! Might need to get myself this shade!